They say to spray water droplets on flowers when shooting close-ups. I prefer to wait for nature to provide the raindrops. Waiting for a breeze to subside: that's another thing. 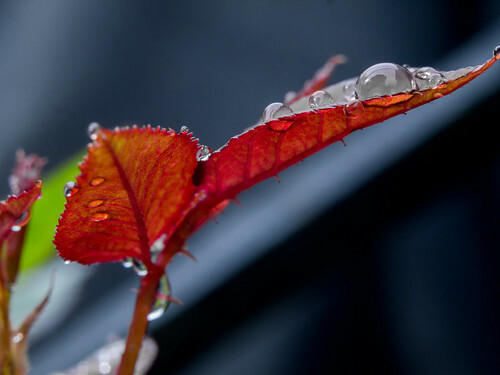 Here, a spring rain refreshes a fledgling rosebush, in a garden in DeKalb County, Georgia, on 12 April 2019. It was during the 2013 Craft Brewers Conference that I took my first whiffs of hops Ariana, Calista, Hallertau Blanc, Hüll Melon, Mandarina, Saphir, and Smaragd, the new German harvest of American-esque hop varieties (although the Germans would NOT like that characterization!). Aromas of melon and mulberries, and even foxy tones. I revere German brewers' traditional, 'noble' hops such as Hallertau Hallertauer Mittelfrüh, but I was impressed by these new kids, bold yet elegantly restrained. During the six years since, those hops have caught on with brewers in the States. Here's one such beer, American-brewed, paying homage back to that. It's Euphonia Pilsner, brewed by New Realm Brewing, of Virginia Beach, Virginia (and Atlanta, Georgia). I enjoyed it al fresco and 'still life'd,' in Decatur, Georgia, on 14 April 2019. German-style pilsner combines tradition with modern hopping techniques for a nice floral hop character. Brewed with German Pilsner malt, and late addition hops to provide a soft bitterness and vibrant hop aroma. 5% abv [alcohol-by-volume]. "Hersbrucker, Huell Melon, Saphir, & Sterling" hops. 5.8% as the abv rather than the website's lower claim of 5%. The provenance, "Brewed in Georgia," whereas the punt of the can is clearly stamped with the words, "Brewed in VA,"
The packaging date: 14 March 2019 (also inked on the punt, under the can). Restrained use of new-age fruity lager hops overlays classic spicy/floral hops. There's a hint of classic lager sulfur but NO hint of the brunchy —egg and apple— foul of many 'craft' lagers. In the background, there's firm shortbread malt. 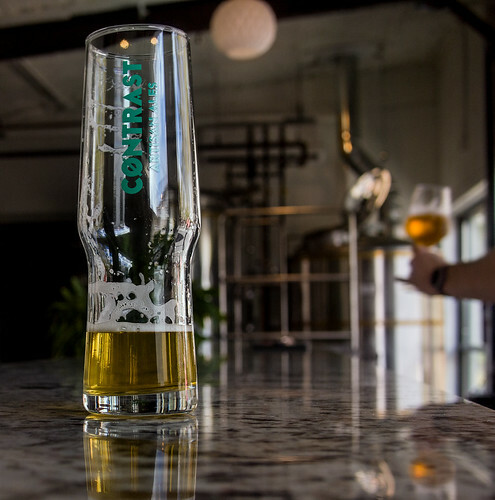 Overall, Euphonia Pilsner is bright and crisp, and overtly, if not bluntly, aromatic, with a sustained finish. It's proof that New Realm's brewmaster co/owner, Mitch Steele —the 2014 recipient of the [U.S.] Brewers Association's Award for Innovation in Craft Brewing, the former head brewer for Stone Brewing and, before that, a brewer for Anheuser-Busch, and the man who literally wrote the book on IPA — knows how to brew a pilsner, by Groll! That the beer tasted 'born-on fresh' a full month after it was packaged is a further testament to his brewing chops. It's early April in Georgia, and many of the dogwood blossoms are already past peak. But not these guys. 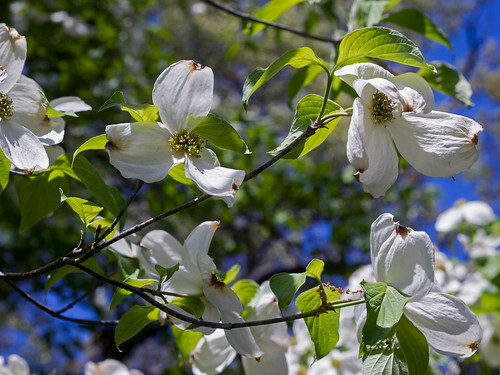 The four showy flower petals of the flowering dogwood (Cornus florida) aren’t actually petals as botanists define them. The dogwood petals instead are modified leaves called bracts that surround a cluster of about 20 tiny yellow flowers. As the flowers bloom, the showy bracts expand to attract pollinating insects. Each bract has a dark red-brown indentation at its tip. Depending on location, dogwood trees may bloom in March, April or May for about two weeks. When pollinated, the flowers produce red berries relished by wildlife. As seen in Sycamore Park, in Decatur, Georgia, on 11 April 2019. This week, a plenitude of American 'craft' brewers are in Denver, Colorado, attending the Craft Brewers Conference/BrewExpo, the industry's annual confabulation, hosted and organized by the [U.S.] Brewers Association in different U.S. cities each year. 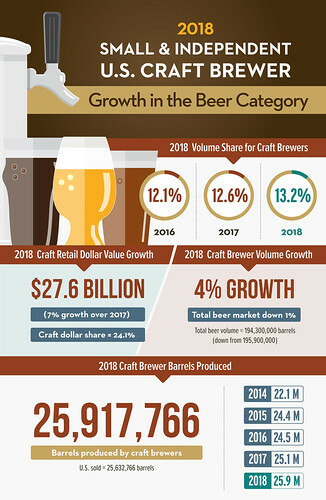 In 2018, small and independent brewers collectively produced 25.9 million barrels and realized 4 percent total growth, increasing craft’s overall beer market share by volume to 13.2 percent. [These] numbers are preliminary. 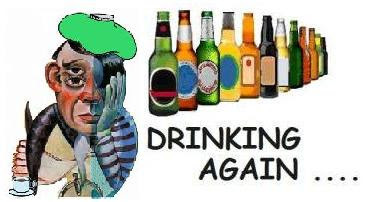 [...] A more extensive analysis will be released during the Craft Brewers Conference & BrewExpo America® in Denver, Colorado from April 8 – 11, 2019. 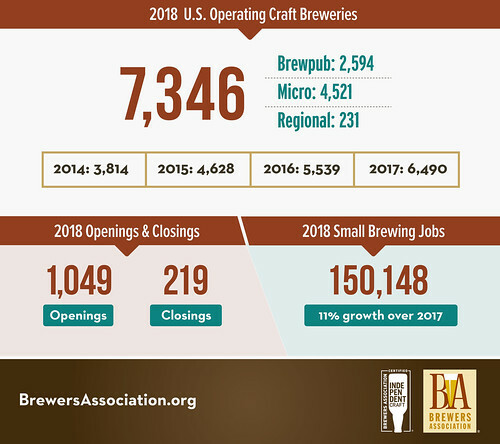 The full 2018 industry analysis will be published in the May/June 2019 issue of The New Brewer, highlighting regional trends and production by individual breweries. And while I'm at it, here's the BA's super-duper definition of its member breweries, that is, its definition of what a 'craft' brewery is. Note, however, that the BA does not define what a 'craft' beer is. An American craft brewer is a small and independent brewer. Has a TTB Brewer’s Notice [Federal license to brew beer commercially] and makes beer. Trailer for the short, "For the Love of Craft," produced by [U.S.] Brewers Association founder Charlie Papaziaan. The film is to be premiered at the CBC. Garage-style doors opened, April spring let in, and Artifice Pale V2 served on draught. It's a Friday afternoon in the taproom at Contrast Artisan Ales, on 5 April 2019. The brewery is new. Contrast opened to the public —in the city of Chamblee, Georgia, population 29,000, a few miles north of Atlanta— only three months earlier, in December 2018. It's owned and operated by Chase Medlin, the past head brewer at Twains Brewpub and Billiards in nearby Decatur. Contrast's taproom is cozy and spartan —a converted auto-repair shop— with local artwork on the walls and a wrap-around white granite bar-top. Wooden barrels double as tabletops in the stool-less small outdoor front patio. The two-vessel seven-barrel brewhouse can be seen in the background. Beers are served from finishing tanks located in a cold room directly behind the bar (to the left in the photo). The pictured beer, Artifice Pale, is a not a hazy or juicy-fruit pale ale but a bright and crisp one with a citrusy aroma and dry finish, at an alcohol level of 5.6% (by volume). I would surmise that an apparent 11% alcohol decrease from the recipe for version 1 decreased the sweetness but increased the perkiness in this, version 2. Neither Contrast's website nor its Facebook page lists the brewery's address (or current beer list). It's: 5504 Peachtree Road, Chamblee, Georgia 30341, just east of the intersection with Broad Street. Pic(k) of the Week: one in a weekly series of photos, posted on Saturdays, and occasionally, but not always, with a good fermentable as the subject. Camera: Olympus Pen E-PL1. Lens: Canon 50mm ƒ/1.4 FD.